What is the Best Running Headlamp for Night Runs? For runners, there will always be obstacles- hills, uneven roads, trails- to overcome that stands in the way of a good run. While most of these challenges can be accomplished without any equipment, night running requires the use of a headlamp and without one you could experience a little turbulence. Nighttime workouts can be rewarding, especially in hotter climates or seasons. They offer solitude on the road that is often a welcome respite from the activities of busy daytime schedules and hectic rat racing. There is just something soul soothing about taking to the road under the night sky with nothing but the pounding of your own shoes to keep you company. However, night running comes with its own set of hazards that daytime runners easily avoid. Click here to read more from Wimi Fitness about staying safe when you run at night. Before we get into talking about the best headlamps for running, let's first address the fact that some runners can't stand running with a headlamp on. It can feel a little bulky, make you uncomfortable, and some even feel hotter/sweatier when wearing a headlamp. If that sounds like you, it might even be the reason that you rarely run at night. 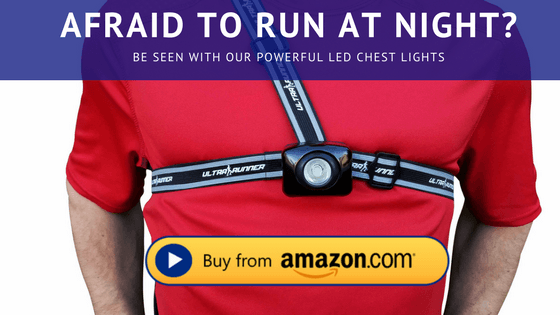 Basically, it's an adjustable LED light that you wear around your chest (think Ironman) that is fully adjustable. Once you put it on, you'll probably forget you are wearing anything at all - which is the biggest benefit. Unseen road hazards or even more sinister threats can cause injury or worse if the road is not well lit. Unfortunately, even the most familiar roads cannot be counted on for lighting. For trails there are roots and dips, streets have cracks and potholes- even sidewalks, where the concrete slab has lifted, can be an obstacle for a night runner. When street lamps have burnouts, this can leave you in a tight spot if you are out on the road without an alternative. Sufficient amount of lumens. More light the better. Illuminates the distance in front of you and fills your peripheral vision. Battery life lasts more than x3 times your normal usage. Beam should be wide and even with no hot spot to distract you. These might seem like a geeky addition to the other – ahem – ultra cool running accessories (insert sarcasm) that we all put on for a workout, but they are a necessary one. There is a huge variety of lamps to choose from that fall anywhere from the $20 to the $200 range. There is also a variety of factors to consider when trying out headlamps for night running. These include weight, comfort, scope of light and battery life. The Petzl Nao Headlamp has built in reactive lighting that actually detects when you need more or less light. Which is I think is both awesome and innovative. The weight is around 6.6 ounces making it comfortable to wear. It does come with the standard straps and a removable over the top strap you can use for extra support. What could be a bit of an issue and not a turn off, is the use of the reactive lighting and it's sensitivity. This headlamps brightness- 350 max lumens- can also be set to a constant mode with less lumens- or through Petzl’s software you can add your own presets​. Some of the downsides include not adjusting properly in fog or breath, being a bit cumbersome, and a high pricetag, but overall, I have been amazingly happy with the Petzl NAO and look forward to trying out more of Petzl's awesome, quality gear. The Sprinter by Black Diamond is my favorite headlamp. It is light, bright and luminescent for at least 5 hours. It sits comfortably on my head without needing adjustment. It has a wide scope spotlight so that I can see all the things I might trip over on the road (as I tend to do even in broad daylight), and even features a tail light so that runners or cars behind me can see me coming and going. I can honestly say that of all the headlamps I have tried, the Black Diamond Sprinter is by far the best. Although I typically stick to road running, trail runners also hail the Sprinter as a favorite headlamp. This may come in handy even during late afternoon or early morning runs in heavily shaded areas where natural light may be limited. The front and back lighting options (as well as the strobe feature) add a safety precaution against wildlife who may otherwise approach a little closer than is comfortable. ​The Sprinter won’t penetrate far into the blackest nights, nor will its USB-rechargeable battery pack last you through an all-night slog, but it’s ideal for feeling quick and unencumbered on shorter week-night runs. The Black Diamond Spot doesn't come with reactive lighting but does allow you to manually dim the light in the flood and spotlight modes. The downside to having the multiple LED settings, is cycling through all them to get to the one you want. But you can also lock it in on that mode. It is definitely something to get used to. The headlamps brightness reaches up to 200 lumens, depending on your battery preference and light setting of course. The material on the strap is soft, can easily be adjusted for comfort, and with batteries it comes out to weigh less than four pennies. If you are looking for something simple and functional, the Spot is an excellent runner up to the award winners. Waterproof headlamps are designed to sustain rain or uncontrolled sweat glands. I think it is a awesome feature to have- unless you don't like to run in the rain. While we don’t want to make excuses as to why we can’t go for a night run, there is a chance you forget to check the weather report and end up in a rain patch at night. It actually happens quite often and can be frustrating if your nightlight burns out. I want to share with some options, at reasonable prices, that will be a worthy investment if your running at night. The unique feature of the IPX 6 Rated Rayvenge is the light trap. It has a wide, soft and slim design for better comfort to your forehead. Compared to other- more bulkier- headlamps, you can slip this into your pocket and not even notice. However, the strap can be a bit flimsy so if it is not adjusted properly it may cause some issues down the road. Compared to the more expensive brands the Rayvenge T1A headlamp is easy to operate, with a single push you will be able access 6 different light modes. The smart lite ultra is made with durable shock proof material that is also Eco-friendly. The design has a unique quality that features a rubber grommet on the inside of the battery case. This allows extra protection from the rain or extreme amounts of sweat. The brightness level punches out at 115 lumens which is awesome, but, the light’s projection is not stellar- 95 meters-making it hard to see further down extremely dark trails. Night running offers the peaceful solitude that participants in the sport tend to crave. Running under the dark sky offers runners a tranquility that is unmatched by daytime workouts. For more information on nighttime running, read our featured articles here. We offer tips and tricks to get the most out of your running experience, whether you choose to run under the sun or the stars. thanks for the sharing about Headlamp. It is a useful thing. Wow, this is really pretty cool headlamp.